Vitamix inspires the creation of new, flavourful dishes in both home and restaurant kitchens throughout the world. In 1949, Vitamix founder William G. “Papa” Barnard created the first infomercial in the U.S. to demonstrate how the Vitamix blender can help families eat healthier with whole foods. More than 60 years later the Vitamix is trusted by more professional chefs than any other blender to create fresh, flavourful dishes from whole-food ingredients, Vitamix is in a class all its own. These self-cleaning machines allow you to chop, blend, cream, purée, and more, through every course of the meal, with a single appliance. With commercial quality and unsurpassed engineering, you can buy a Vitamix once and have it for life. Coveted by restaurants and professional chefs worldwide. Able to make smoothies, soups, frozen desserts, and more. Renowned as the world’s most versatile, most durable blender. A Vitamix performs more than 50 kitchen tasks without any additional attachments. From frozen dessert to steaming hot soup, create entire menus with the technology that redefines what a blender can do. With a 2HP motor for household machines, quickly blend virtually any whole-food ingredient with ease. The size and shape of the 2 litre is ideal for blending medium to large batches. The variable speed control lets you fine-tune every texture, from smooth purées to chunky salsas and everything in between. At least a dozen tiny details go into the design of Vitamix such as using only the best aircraft-grade, hardened stainless steel blades. All to give you the best possible morning smoothie, winter soup and frozen sorbet. Instead of plastic components that wear quickly, Vitamix uses a metal drive system to connect the container to the motor base, allowing better blends and longer lifespan. With the push of a button or the turn of a dial, Vitamix machines self clean in 60 seconds or less, no disassembly required. 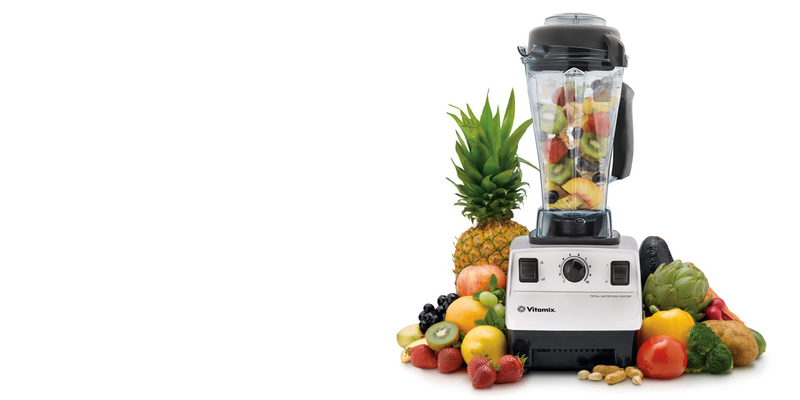 Simply put, a Vitamix is more than a Super Blender, it is a lifestyle!